Reusing content has substantial benefits over copying and pasting. However, reusing content can be complex to manage without proper guidelines, especially when that content is translated into multiple languages. 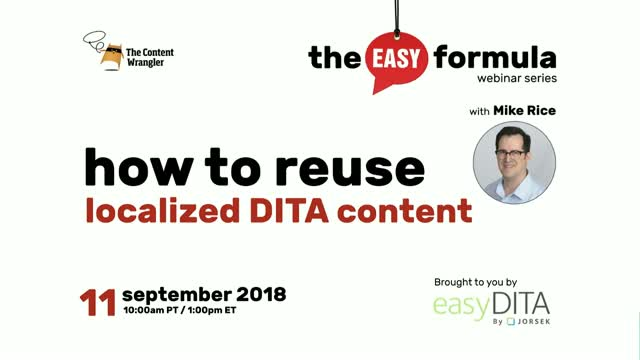 Join Scott Abel, The Content Wrangler, and his special guest, Mike Rice, Customer Success Manager at Jorsek LLC, the publishers of easyDITA, to learn some reuse strategies for localized content so you can safeguard your reuse cases. Mike Rice is a user-centered professional with over 20 years of experience in technical communication, and a tested eye for transforming how information is managed. Mike is thrilled to be supporting information professionals using easyDITA, and to help them focus on their content, its meaning, its value, and its connections.